Assam JMEE 2018 or Assam Joint MCA Entrance Test will be conducted by the Directorate of Technical Education, Assam for admission into 1st semester class of MCA course 2018 at Assam Engineering College, Guwahati and Jorhat Engineering College, Jorhat. 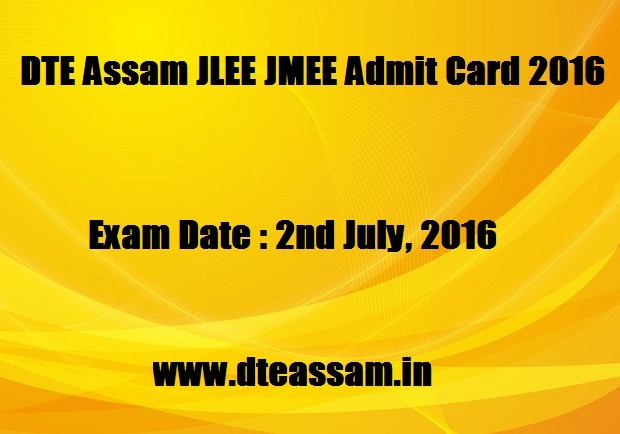 Interested candidates can check all the details of Assam JMEE 2018 like application procedure, eligibility criteria, selection procedure etc from this page given below. Eligible Degree holders interested to take admission in MCA Course for the session 2018-19 at Assam Engineering College, Guwahati and Jorhat Engineering College, Jorhat may apply online. Candidates will be selected from merit list prepared on the basis of total marks scored in the admission test. Eligible candidates can apply online. Before going to apply candidates must check all the details carefully. Examination Fee for JMEE 2018 will be Rs. 1000/-(One thousand only) which will have to deposited through Demand Draft drawn in favour of The Director, Technical Education, Assam payable at State bank of India, Kahilipara branch, Guwahati. Candidates appearing in their final examination may also apply for provisional consideration. Such student will have to give an undertaking that he/ she shall be able to produce final mark sheet/ certificate of qualifying examination within 2 (two) months of taking admission failing which the admission of the student shall automatically stand cancelled. Also, such candidate will have to produce all mark sheets up to 5th semester in degree level for verification during Counseling as documentary evidence that he/ she has cleared all subjects up to the 5th semester. Admit Cards/Hall Tickets can be downloaded from the website by putting the Application Number and Date of Birth of the Candidate or through the direct link provided below. It is for information of all concerned that the date of the Joint MCA Entrance Examination (JMEE) 2018 is hereby deferred because of some official reasons. The new date of Examination will be 02 July 2018 (Saturday) in lieu of 26 June 2018. The Examination timing will be as printed in the Admit Card.